‘Football Club Shakhtar Donetsk. The official history. 1936-2016’ – this is the third edition covering every stage of development of the Donetsk club: from the first days of its establishment to the most recent season. The bright book, featuring a thousand photos from different eras, tells how – over the 80 years – Shakhtar has developed from a provincial team into the leader of Ukrainian football and has become one of Europe’s best clubs. - As you know, the year 2016 passed for Shakhtar under the sign of its anniversary: ​​the club turned 80. And we have prepared a presentational edition – the book telling the history of creation, formation and development of the Donetsk team, - tells the co-author Andrii Babeshko. - This is the third edition, and its fundamental difference from the previous ones lies in the fact that it separately presents the top 100 players to have made the most appearances for Shakhtar, alongside the team's top scorers and the list of all Shakhtar coaches to have been presented for the first time ever. The authors of the new book, just as of the previous two editions, are Oleksii and Andrii Babeshko. On 528 pages, they managed to tell us about every milestone of the history of the club, with a separate story dedicated to each season. Oleksii Babeshko told about the project work. - We really have tried to change some content, paying more attention to personalities. And they certainly deserve it. Because the story in the book was written by the players - their work, skills, brilliance, longevity, and their desire to score goals. Each of them will receive this edition as a gift and, I think, will find there many wonderful facts about themselves, sometimes the ones they never expected to see in it. In this book, we present all the coaches of Shakhtar for the first time. It so happened that in previous editions they were mentioned just superficially, while this time we present their portraits and achievements. And I think this is also very good for the people who root for Shakhtar, who worry about the team. We exchanged opinions with Sergei Palkin and agreed on the fact that when the desire of the club to honour its history coincides with the desire to tell about it, then we get such a good publication. I started studying Shakhtar history back in 1967, exactly 50 years have passed since then. For me it is very pleasant and symbolic that such a major date has coincided with the presentation of the book. Some chapters of the book are dedicated to the most outstanding players and coaches of Shakhtar. For example, the Shakhtar top 100 players list is topped by Darijo Srna, the record holder in terms of the most appearances. The captain himself has not missed the opportunity to attend the book presentation. 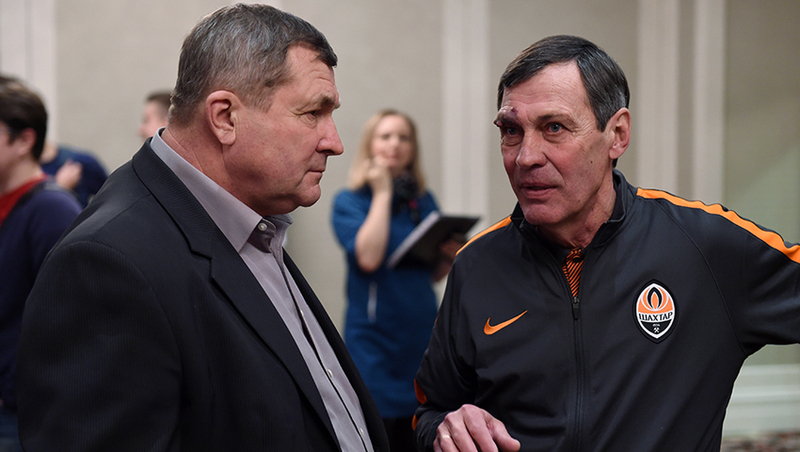 Also, the event was attended by other Shakhtar legends of different times: Valeriy Rudakov, Igor Leonov, Gennadiy Zubov and one of the best strikers in the history of the Orange-and-Black side Andrii Vorobei. - When I just started playing, of course I had my idols – the likes of Vitaliy Starukhin and Viktor Grachev. I looked up to them and dreamed of reaching such heights. It's nice that for a long time I used to be the top scorer in Shakhtar’s history. But every record will be beaten sooner or later. That’s why I rejoiced at the success of Luiz Adriano, I also wish the young players to improve our achievements. Nevertheless, I left my mark in the Pitmen’s history, being happy that I show as a role model to the young guys that nothing is impossible. You just need to try hard, and then you can achieve such results. FC Shakhtar CEO Sergei Palkin handed the first copies of the new publication to the team veterans and the captain Darijo Srna.